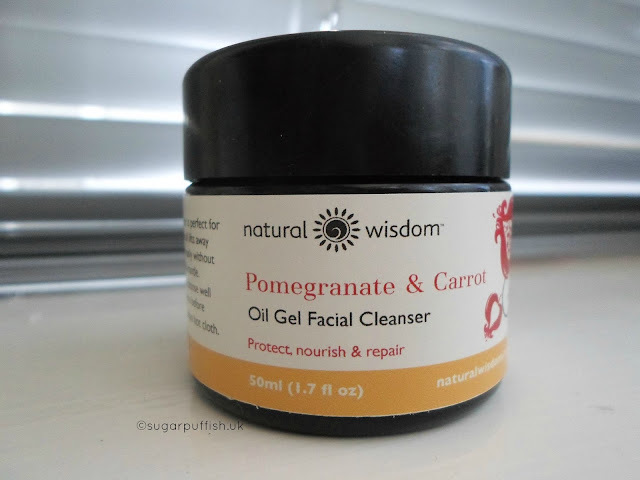 "Our unique blend of organic CO2 extracted raw seed oils of Pomegranate and Carrot together with our CO2 extracted raw botanical extracts of Rosemary, Calendula, Chamomile and Hypericum soothe and calm your skin." Natural Wisdom is a brand I have known for quite some time. I have watched Maeve build her product line and whilst I have talked about them here and there, I had failed to review. I recently spotted a new product added to the range and I was intrigued so I placed an order. If you are following me on social media you will have seen me mention the Oil Gel Facial Cleanser with Pomegranate & Carrot Seed Oils. The Oil Gel Cleanser is suitable for "Sensitive and reactive skin prone to redness. Very dry skin. Sun damaged skin and mature skin prone to dryness." What I love most about Natural Wisdom is they give the customer an option to purchase products without essential oils so that’s exactly what I did. 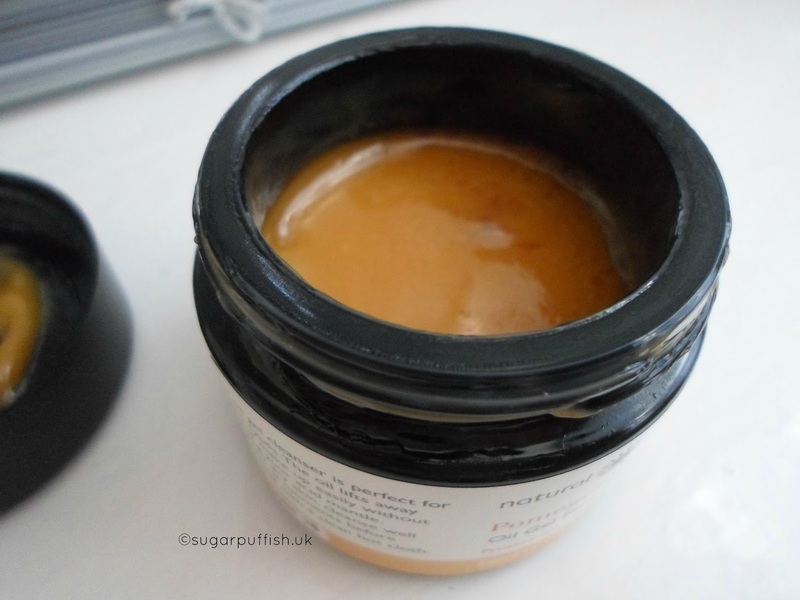 After sharing on Twitter, I have frequently been asked “what is the texture like?” and in all honesty the first thing that springs to mind is thick runny honey. I basically dip my fingers into the jar (or use a spatula) and spread across my face. As you massage the cleanser onto skin it eventually feels less sticky and becomes oilier. As per the jar, I have been removing with a hot damp cloth but I noticed on the website that the description mentions that the cleanser turns milky with water. I have found this transformation isn’t noticeable when using a cloth. I can reassure you that either method of removal is easy plus leaves my skin feeling soft and never dry. For a long time I have become bored of the same old products. Whilst there are many amazing natural and organic brands out there sometimes it does feel like products are all very similar. Aside from packaging and marketing the core ingredient and product performance vary ever so slightly. This is why Natural Wisdom’s Oil Gel cleanser peak my interest. It really does feel like a unique product which I have never experience before now. Off the top of my head I'd say the closest product would be Odylique's Silk Touch Cleanser. With Natural Wisdom you are getting vegan and raw ingredients which is why for me it stands out from the crowd. I am very enthusiastic about this cleanser as it works brilliantly for my overly fussy, eczema/dermatitis prone face. It’s a pleasurable experience to massage the gooey mixture across my face and have skin feeling baby soft after removal (never greasy). I find very little criticisms aside from sticking fingers in jars (you could use a spatula) and the slight carrot-orange tinge on my beige bathroom sink come the end of the week (although to be fair a side effect of most oil cleansers). So it's a thumbs up from me but have you tried any products from Natural Wisdom? Which are your favourites? I haven't tried any products from Natural Wisdom yet, it's actually first time I heard about them, but I checked their website now and they definitely have some interesting products which I would love to try. Thanks Sarah for introducing me to the brand! Looks great and I will check to see if they ship to the U.S. Thank you for saying so many products are alike as it really seems to be true. So often I read about a line or specific product that suggests this is the first of its kind but most of the time it sounds as if it is similar to something that is already produced. Don't get me wrong, I think it's great to have options from which to pick your favorite of a particular category but the descriptions can bug me. Wow - this is so unique! The texture sounds fantastic and I love that it's for soothing skin as well as cleansing it, I'm so prone to redness with cleansers but this sounds wonderful. Natural Wisdom have become an obsession of mine recently! I adore their Vitamin C moisturiser. This looks super interesting!